Betting in proactive monitoring, Volvo CE is just bringing to Brazil its new Active Care Direct (ACD) service, which increases the functionalities of telemetry when filtering for the user the most important information about equipment maintenance, which is completed by practical recommendations for clients and dealers. This is now going to stay in the past. With the ACD, Volvo intends to offer a continuous service of monitoring, consulting and emitting reports that come from thousands of data collected by their Matris and CareTrack electronic systems. The systems list actions and components that the client may check directly. The dealer will help in diagnosis and actions, being available for a visit if the client could not correct the problem with its own means. After the automatic filtering, client and dealer receive consolidated monthly reports that include data from machine use and operator trends and behavior. They also compare groups of machines and even show machine-by-machine information. “There is a universe being discovered here with an important tool of proactive coverage that allows better attendance and increases client’s efficiency”, comments Luiz Marcelo Daniel, president from Volvo CE Latin America. Including hardware of control and module of communication by satellite, the basic principle for installing ACD is that the equipment has to use an electronic engine. Thus, the tool will be factory-available for a wide variety of models, starting from L60 loaders and EC140 excavators, in addition to the whole articulated line. It is also possible to install the system in older machines, a kind of technologic retrofit. In other words, the system analyses and filters in real time the most important parameters for each operation, following the integrity and performance of the machine. The monthly report includes fleet using data that allows to check the working time of each machine and to compare it to its idle time individually, by model or by month, for historic reference. Therefore it is also an important base for improving qualification training of operators. But the correction is not still automatic. The system proposes improving solutions based on the data that are also sent to the dealer that—in the most critical situations—installs them together with the user. “Everybody has tools of telematics, but this new product goes right to the point”, points out Wagner. In this line, the monthly reports of the ACD show the trends of using the machine, mainly concerning to fuel consumption, idle time, etc. In addition, the consultants from Volvo stay on demand to contact the client, interact with the dealer and carry out the repairs, if necessary. 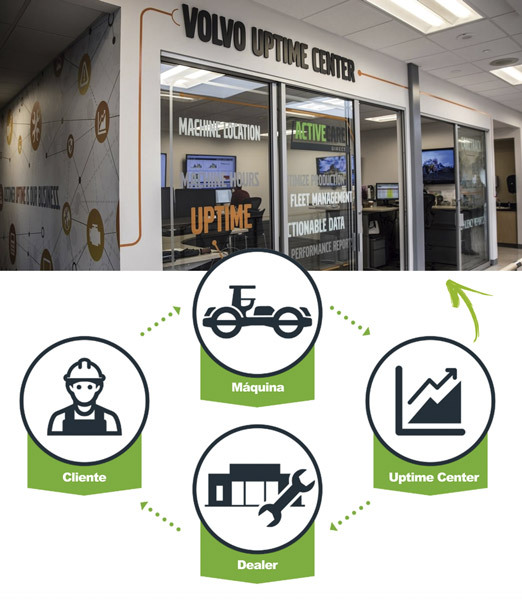 In USA and Canada, the supporting structure from the Volvo Uptime Center is located at Shippensburg. In Brazil, the structure is located at Curitiba (PR).